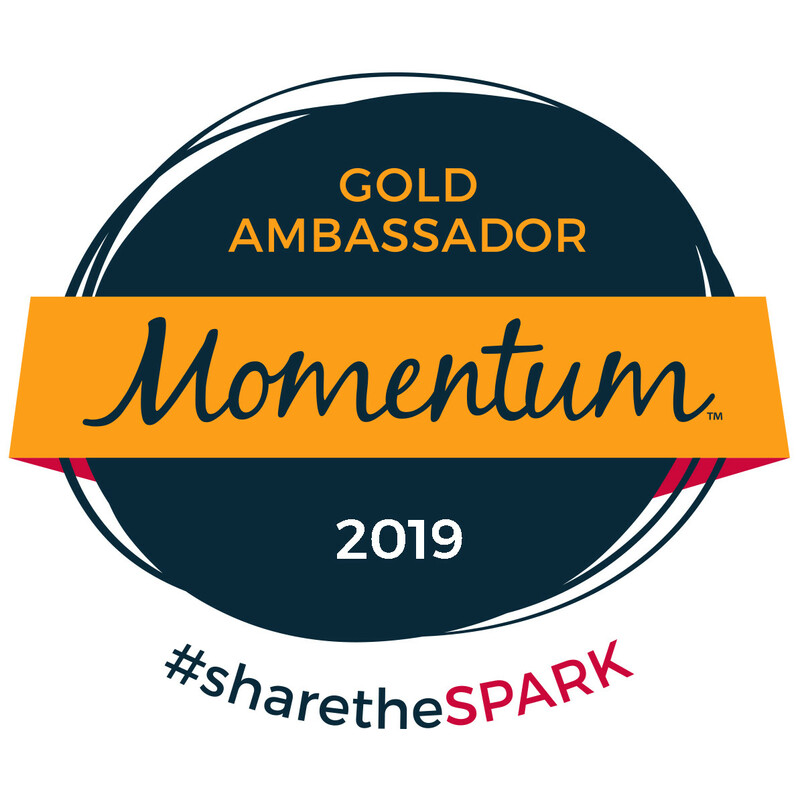 I received free product samples for the purpose of this review and giveaway. The opinions expressed here are 100% mine. This post contains affiliate links. 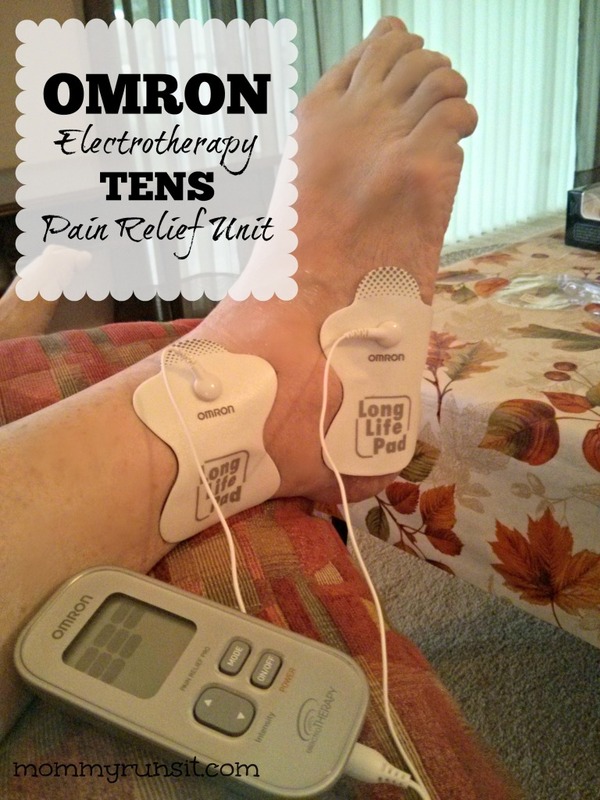 When Omron contacted me to review one of their TENS devices, I had no idea that electrotherapy was even a thing. And I certainly had never heard of transcutaneous electrical nerve stimulation (TENS) as a method for treating pain. I’m guessing I’m not alone – so let me give you a little info about TENS before I tell you about the device itself. TENS technology has been used by physical therapists, chiropractors, and other medical professionals for more than 30 years. It’s non-invasive, drug-free, and accessible. Easy To Travel With: Sturdy belt clip and soft carrying pouch for using anywhere, anytime. 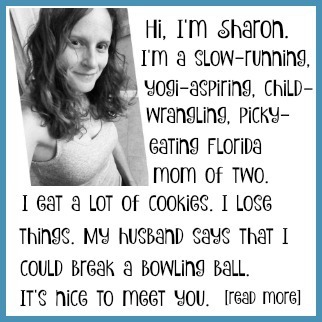 Fortunately, I’m not currently dealing with any significant pain (other than the usual aches and pains of being 40 and a long distance runner). So instead of trying it out myself, I decided to ask my mom to give it a test drive – she has severe, chronic pain in her right knee and both ankles, and I was really interested to see if the TENS Unit would make a difference. Frankly, I was a little skeptical – it seemed a bit gimmicky to me. My mom’s ankle pain has been incapacitating at times, so for her to notice any improvement, let alone a significant one, is really saying a lot. Before starting the TENS treatment, she experienced severe pain in her ankle just from standing. Now she’s able to stand AND walk on it with much less discomfort. She continues to use the TENS Unit once a day on her right ankle and sometimes on her left ankle as well. She is so pleased with the product – and if mama’s happy, everyone’s happy, right? I’m not sure if my mom’s experience is typical, but considering the severity of her pain, I take her testimony quite seriously. 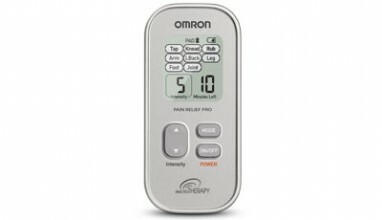 You can learn more about the Omron TENS Unit and whether it might be right for you at OmronHealthcare.com. 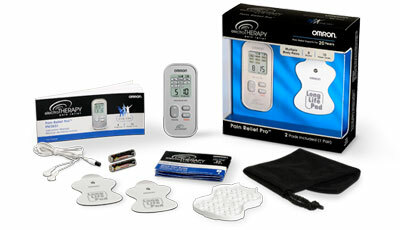 And thanks to Omron, one lucky reader will have the chance to win their own Pain Relief Pro Unit (MSRP $69.99). Everything you need to enter is on the Rafflecopter below. These are really cool machines, being able to re leave pain in the body is a big help. I have heard of TENS but never tried it. I would want my husband to try this he is a carpenter and his back and knees hurt. I think this would be another option for him. I have never heard of TENS therapy. I would use it on my back. Oh this would be so wonderful for me! I have nerve damage from surgery in my back and my hip spasms all the time. I would love this to try to stop the pain! I was invited at work 4years ago and after two surgeries I still can’t walk. The tens unit helped a little at therapy so I would love to win this. Glad that it helped your mom, foot pain is horrible!! I’ve never heard of it. But I’m really interested! I have lots of pains in different places. I’d start out with it on my upper and lower back and my shoulders. I have heard of it , but have never tried it . would love it for all my aches and pains. I have a torn rotator cuff and other issues in my right shoulder that need to be operated on this coming Spring once I am laid off from work for the season… I go to physical therapy and they use a TENS unit on my shoulder and it feels pretty good afterwards and I am able to continue working thank goodness. 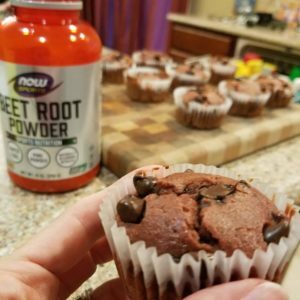 This would be wonderful to try right here at home after a long day of work for pain relief. yes i have heard of this product and i WOULD LOVE to win this for my dad for christmas!!! he struggles with back, neck, and knee pain and this would be AMAZING for him!!!!! I havent heard or used this before but I have back pain and this would be awesome! My husband has used his mother’s TENS unit many times and swears by it for his low back pain. We would love to have one of our own! I have used a TENS on my leggies after long runs. I could so use one now! I actually use this unit during my PT sessions! Thanks for the giveaway! I have never heard of TENS therapy and I Have never tried it before, but it looks quite interesting. I would use this for pain in my wrist from my tendonitis. Looking for a TENS unit for my poor hubby ! Having a lot of sciatica 🙁 Thank you for the opportunity to win !! I would give this to my mom, she has bad shoulder pain. Yes, I’ve heard of Tens therapy and we used to have a unit, but we sold it. I would love to have it back or a new one. I have tried it before but mine was a smaller & cheaper one. I used for my neck & arm. I need a bigger & better one. thanks for the chance. I have heard of this, but have not tried it. I would use this for my low back pain. Oh, I need this for ALL my aches and painS! I am willing to try anything to help my hip feel better and heal soon!! I would LOVE to try this! My knees would thank you if I won. 😉 I haven’t heard of it, but would really love to try it. I used it at PT for achilles & ankle injuries. Yes. I have heard of Tens therapy and I would love to use it on my upper back/shoulders where I carry all my tension! I have heard of these! I looked into it when I was injured with a stress reaction/fracture. I’m glad I don’t have that injury anymore but one of these would come in handy if I did. Yes, I am using it now in physical therapy. I would use it on my back and shin. I haven’t seen this specifically, but would totally use this on my hips and glutes to get those bad boys firing correctly. I have only heard about this recently through fellow bloggers and I really need it in the worst way right now!!! I LOVE Tens… I need one terribly. I keep borrowing my friends, lol. I was looking to get one for christmas. They are REMARKABLE!!! I have issues with tendinitis would use on ankle and foot. I used TENS when I was in PT for Achilles tendonitis. It was actually my favorite part because it made my ankle feel so much better. I have heard of TENS therapy, but have never had it done. Currently I’m dealing with plantar faciitis in my left foot. It hurts like crazy! I think this would be a great gadget to have to help with the pain so I can get back to “normal” faster! great review. I only recently started hearing about TENS. In PT I occasionally do Itonphoresis (I am spelling that wrong) which is similar to TENS. This kind of thing is great for injuries that need more blood flowing! Right now I am dealing with a tight calf and pain on the top of my foot that I think would respond well to the tens. I heard about it on another blog but haven’t tried it yet. I have never heard of it but I’m intrigued. My mom has been having some weird shoulder pain that her doctor hasn’t been able to figure out. Maybe this could help her. Would save me trips to pt!! I have heard of TENS therapy but have never personally used it. I would love to try it for my shoulder and my leg issue that I have with my Pirformis muscle. I’ve heard of TENS but never tried it myself. I’d use this for my knee & PF pain. Coincidentally I think I just tried this out at an expo today. It was a really interesting concept. It did feel good for the few minutes that I tried it.